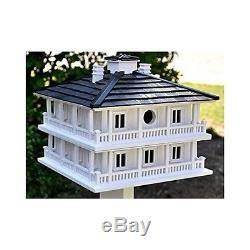 Birdhouse for Outside Southern Plantation Clubhouse Outdoor Nesting Birds Wood. NEW Southern Plantation Clubhouse Birdhouse. Re-creation of one of the most famous sites in golf. 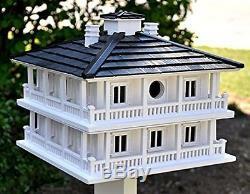 The Clubhouse Bird House is a classic way to offer your birds a place of nesting. Each level of the house is surronded by a porch. This Southern Plantation design has balconies all around the four sides and two separate nest boxes. Birding parents will enjoy nesting in this functional birdhouse while their mates go out to play a round or two! The openings of the two entrances holes for each compartment are 1 1/4 which will attract a host of birds such as Wrens, Finches, Chickadees, Nuthatches, Titmice, and downy woodpeckers. The top level detaches from the bottom for easy seasonal cleanout. Handcrafted of kiln-dried hardwood, exterior plyboard and non-toxic base exterior paint make this bird house a centerpiece in any garden or backyard. Constructed of exterior grade ply-board and a removable bottom panel for easy cleaning. Functional birdhouse for outdoor use. Size: 11 H x 12 W x 12 D. Wood construction, unpainted interior, ventilation and drainage. Correct hole size for common nesting birds. The item "Birdhouse for Outside Southern Plantation Clubhouse Outdoor Nesting Birds Wood" is in sale since Saturday, January 27, 2018. This item is in the category "Home & Garden\Yard, Garden & Outdoor Living\Bird & Wildlife Accessories\Birdhouses".